In large, nonstick skillet heat oil over medium high heat. Add veal and quickly brown on both sides, about one minute each. Remove to an oven proof serving platter. 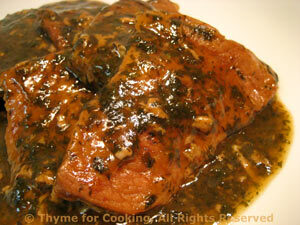 Keep veal in a warm oven (125F, 75C) while finishing sauce. Add the Marsala, beef stock and parsley to the skillet and stir to scrape up any browned bits.